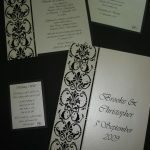 White cards with black velvet flocked specialality paper on the side . 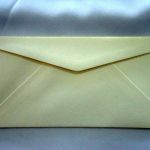 Cream mist envelope. DL size. Sold per envelope. Dl landscape pouch with gold backing papers and moonlight vintage paper to print on. 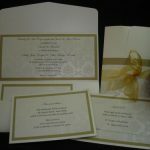 Invites starting from $3.95 fully printed and assembled, extra cards starting from $1.20 each fully assembled. Please call or email for correct pricing. 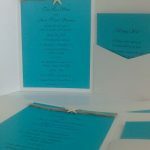 Rectangular shaped invite with turquoise paper, twine and starfish to finish. Pocket on right side for extra cards.